Veterinarian knowledge base platform with search for veterinarian or vet clinic by name, specialty or area. VetDoc is a veterinary knowledge base and cooperation platform that offers advanced veterinarian/vet clinic search. This website’s goal is to simplify the process of searching for a veterinarian in your area and to promote knowledge sharing between professionals and animal owners. Veterinarian database currently contains veterinarians from France, but over time it will be extended with other countries, like Switzerland, Belgium, Germany, etc. Client requested the sophistication in architecture and the simplicity in user interaction. So Quintagroup stood up for a challenge. Veterinarian search allows searching for veterinarian or vet clinic by name, specialty or area, offering even results in 5-25 km radius (based on Google map integration). Veterinarians can be added to user profile so that their contact and educational information is at your tips. Veterinarians themselves can update information presented on their website profiles. Articles in the form of blog are added by the site administrators. They can be shared, added to favourites, and commented on. Quintagroup created website design, provided its responsiveness and accessibility. Search and account management are user-friendly yet powerful. Current database contains over 20 000 veterinarians and over 10 000 clinics. PostgreSQL and Elasticsearch are scalable and ready to be filled in with even larger numbers of profiles. 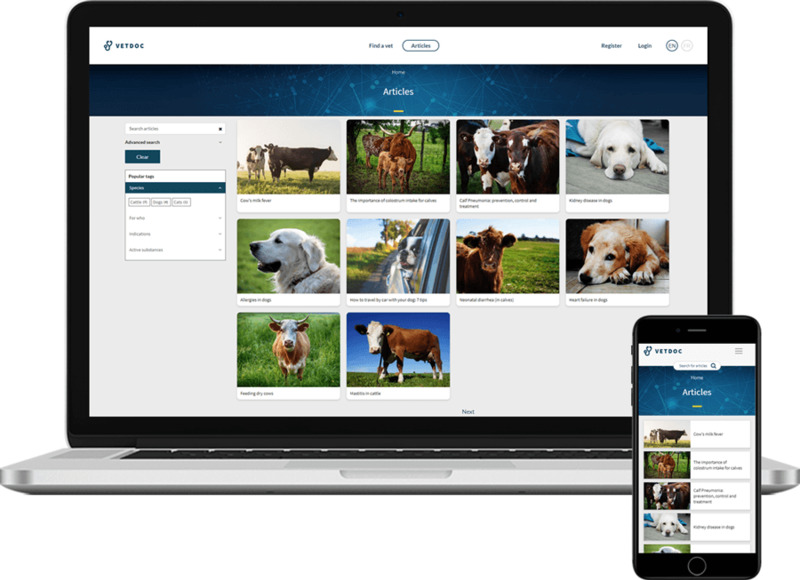 In order to further ensure increased cooperation with the end users, VetDoc offers collaboration with the VetPharm website and its animal health management center. Our team developed an API, so that users can log into the Vetpharm website with the VetDoc credentials. VetPharm allows veterinarian search and article listing. Veterinarians added to the profile on VetDoc will be also available on VetPharm and can be later added to prescriptions, dispensings, etc. Pytest - convenient framework for functional testing.